Bangladesh is connected to two important figures in the history of Tibetan Dharma. Its town of Chittagong (formerly, Chativaho) was home to the mahasiddha Tilopa (10th to 11th century). 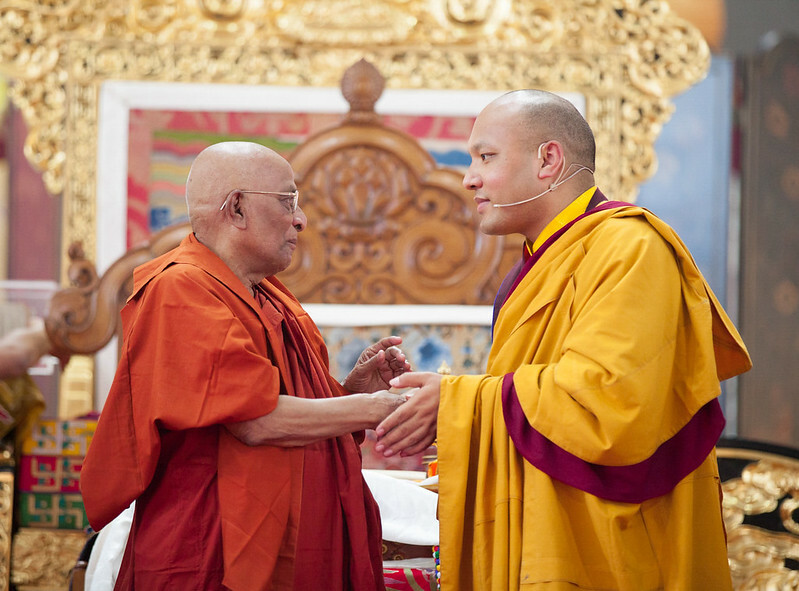 He is the source of the Kagyu lineage and is considered the embodiment of Chakrasamvara, the main Kagyu yidam deity, whose empowerment the Gyalwang Karmapa bestowed on February 6, 2017 in the Monlam Pavilion. Bangladesh is also the birthplace of Atisha Dipankara (982-1054), the great Kadampa master who, in the latter part of his life, taught in Tibet and had a wide influence on the development of Buddhism there. Although these days Bangladesh is mostly a Muslim country, Buddhism was the predominant faith in the area up to the 11th century, and today 3 million of its 170 citizens are Buddhist, making it the third largest religion in Bangladesh. Over 65% of the Buddhist population is concentrated in the Chittagong region, which was home to Tilopa. HH Sanghanayaka Suddhananda Mahathero, who came to the Monlam Pavilion today, is head of Dharmarajika Buddhist Monastery and Chief Patriarch of Supreme Sangha of Mahanikaya Bangladesh. In 1978 he had traveled to China to retrieve precious Buddhist objects, which included a stupa with the precious ashes of Atisha and a very old Tibetan text of his biography in the form of a supplication, composed by Dromtönpa (1004-1064), his chief disciple and founder of the famous Kadampa lineage. The text is titled, A Supplication to Jowo Je Palden Atisha Presenting His Life Story. The Mahathero, who is eighty-six years old, resolved to offer some of Atisha’s ashes to the Karmapa so that a connection could be made with Tibet. He created a golden replica of the original stupa and placed some of the ashes inside a slightly curved cup with a dome-shaped cover. Carrying this stupa and the text, the Mahathero made a long journey from his Dharmarajika Buddhist Monastery in Dhaka to the Monlam Pavilion in Bodh Gaya to offer the stupa to the Karmapa and show him the precious text. In the Mahatero’s entourage of some ten people were Dr. Kalyan Priya Bhikkhu, Abbot of Bangladesh Buddhist Monastery in Bodhgaya, Ranjit Kumar Barua, former Joint Secretary to the Government of People's Republic of Bangladesh, Nandita Barua, Vice President of the Women's Wing of Bangladesh Bouddha Kristi Prachar Sangha, and Wasfia Nazreen, who had organized the event. Before coming to the Pavilion stage, the Karmapa met with the Mahathero whose personal warmth broke through the usual formalities as he gave the Karmapa a fatherly hug. Smiling, the two walked onto the stage, and the stupa was placed in a graceful silver pavilion on the Karmapa’s throne. Mahathero was offered a prominent seat while his entourage, all from Chittagong, sat nearby. After the Red Crown ceremony, he opened the stupa to show the Karmapa the cup with the ashes, and with great reverence, the Karmapa placed it on his head, and then on Gyaltsap Rinpoche’s as well. The Karmapa was also offered a thangka of the three deities of long life—Amitayus, White Tara, and Ushnisha Vijaya—and the Karmapa in turn offered the Mahathero a magnificent statue of the Buddha. There was a warm feeling of friendship during this time on stage, and the sense that these precious relics of the great Atisha will have a special place on the Karmapa’s shrine.